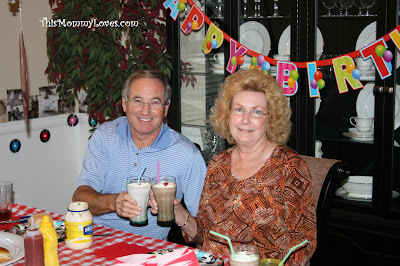 Tweet My parents both turned 65 this month just 3 days apart so since this was a pretty big birthday for them, I decided to throw them a 50's diner themed birthday lunch. I picked up some old records at the Goodwill store for $0.59 each as used them as chargers under our paper plates . 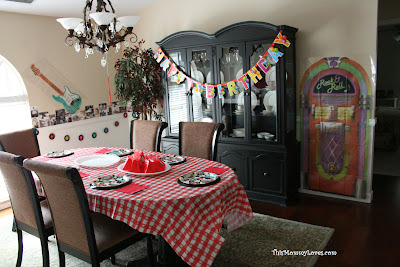 I also got some 50's theme decorations at the Party Store and hung record-garland around the room along with some giant Rock and Roll signs and big guitars along with a big cutout of a jukebox. 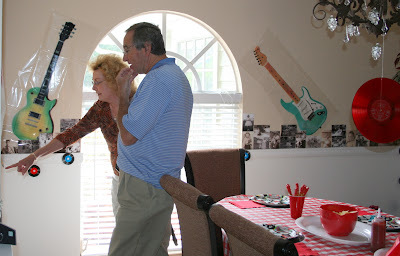 My favorite detail of the party was that we lined the room with old photos of Mom and Dad from the 50's and 60's. It was really fun to see them walk around the room looking back through time. 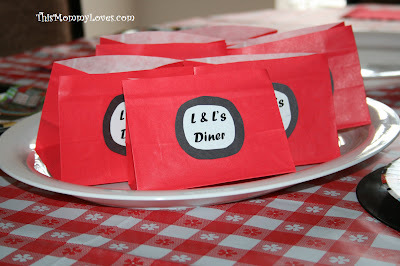 French Fry Bags: I got red paper lunch bags from Wal-mart and just cut off the top and added a little Diner logo. Milkshakes were served out of Coca-Cola glasses I got at the Dollar Store. 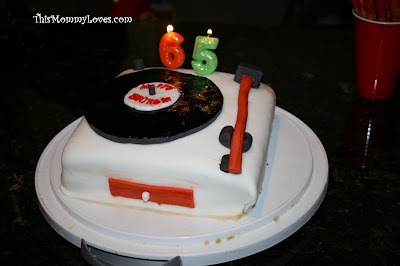 Beautiful record-player cake that my brother and sister-in-law made with fondant. 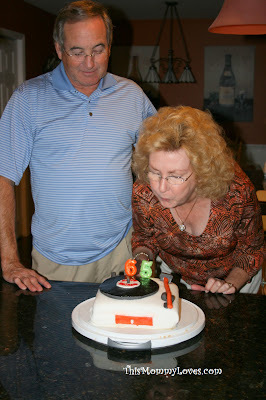 Happy Birthday, Mom and Dad! Love you!!! Very cute idea! I love your decorations! I am sure they had a ball! I love the chargers. I always wondered who buys those records at Goodwill. I want to buy some but I have no need for them. If I ever have a 50's themed party, I'll use them as chargers too. So cool! Very cool party! 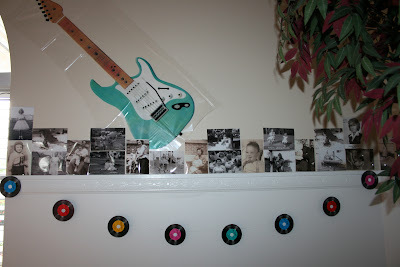 I recently did a 50s party for my 8 year old and it turned out so cute. We also did a cool thing with a record where we put it in the oven over a metal bowl and melted it. It turns into a bowl. So neat. I posted on the party in a few weeks ago if you have a chance to take a look. Using the records as chargers is genius! Love all the details. So cute! I love the personal touches. That is darling. So many special touches that must have made it so memorable. Visiting from Shabby Nest! 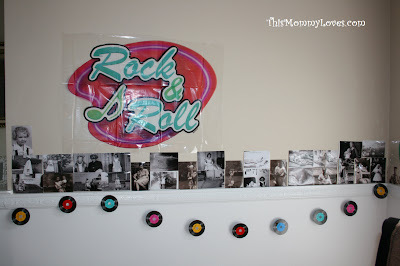 LOVE your 50's theme party! Such fun & fabulous ideas! That cake was AWESOME! How great. I am sure they loved this. Such attention to detail!!! such a cute cake. 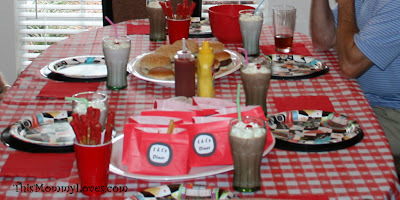 i had a 50's theme sweet sixteen, lol. i always joke that i was born in the wrong era! What an amazing party! Love how you personalized it! What a great party. 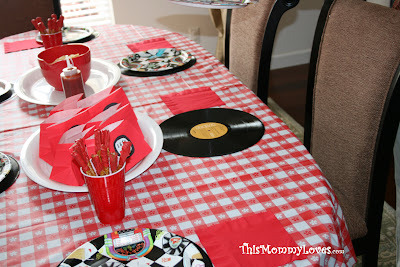 I am planning a 50s theme birthday and love some of your ideas. Your cake is the greatest and may become to center of my dessert table. Thanks for sharing such fun ideas. I googled "50's theme party" and this came up. Great ideas!